Knorr Mexican Salsa is a perfectly chunky and aromatic salsa with a touch of spiciness. Great for dipping nachos or as a topping in fajita. Contains spice, yeast, vegetable and corn products. 12 Months Unopened. Open shelf life 1 month maximum under refrigerated condition (0-4°C) without cross- contamination. Ambient (Store in a cool and dry place), Max 30°C. 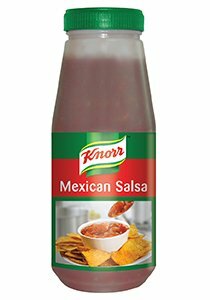 Knorr Mexican Salsa is perfect for dipping. Another great use is topping your fish or chicken before baking to serve in tacos.